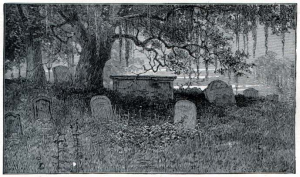 Need some old images like the nice graveyard below for your Website or Project? FromOldBooks.org has tons of images scanned from old books. The best about it: They are free as the copyright has expired. Please donate, if you like and use this page often.